Murderous Melbourne features items from the University of Melbourne's extensive collection of Australian crime fiction. [... Also t]he architecture students have designed a Centre for Australian Crime Fiction, to be located on the car park adjacent to the north court of the Union building. [...The] landscape architecture students have designed stage props for S. H. Courtier's crime novels See Who's Dying (1967) and Murder's Burning (1967), both set in the Australian outback. Dr. Groves is to be congratulated for this intriguing blend of literature and design, mobilizing students as well as library personnel and resources to present this exhibition. 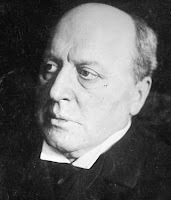 Christopher Morley spoofs Henry James. "Thorncliff was thinking, as he crossed the, to him, intolerably interwoven confusion of Market Street, that he had never--unless it was once in a dream which he strangely associated in memory with an overplus of antipasto--never consciously, that is, threaded his way through so baffling a predicament of traffic, and it was not until halted, somewhat summarily, though yet kindly, by a blue arm which he after some scrutiny assessed as belonging to a traffic patrolman, that he bethought himself sufficiently to inquire, in a manner a little breathless still, though understood at once by the kindly envoy of order as the natural mood of one inextricably tangled in mind and not yet wholly untangled in body, but still intact when the propulsive energy of the motortruck has been, by a rapid shift of gears and actuating machinery, transformed to a rearward movement, where he might be and how." Catching Up with Book Auctions. At Bloomsbury's June 19th auction, Robert Bloch's Psycho netted $1000, James M. Cain's Mildred Pierce went for $400, Conan Doyle's The Memoirs of Sherlock Holmes went for $1500, and Patricia Highsmith's Strangers on a Train and The Talented Mr. Ripley netted $2200 and $1600 respectively. The William Goldman screenplays, including one for The Moving Target and a letter to Kenneth Millar, went unsold, as did George V. Higgins's typescript of "Mother's Day." Where Do You Get Your Ideas? 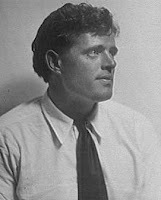 Don't Ask Jack London. 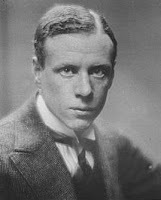 "...when [Sinclair] Lewis was starting out, he picked up some money by suggesting story ideas to [Jack] London." More here regarding the London-Lewis relationship; also see this article on Lewis by Gore Vidal. Happy birthday, Dorothy Gilman; Josephine Tey. Today marks the 85th birthday of Mrs. Pollifax creator Dorothy Gilman; and Elizabeth Macintosh, aka Josephine Tey and Gordon Daviot, was born today in 1896 in Inverness, Scotland. Author of mysteries such as A Shilling for Candles (1936), Miss Pym Disposes (1946), The Franchise Affair (1948), and Brat Farrar (1949), Tey died in 1952. Wrote Anthony Boucher in the New York Times of Tey's The Daughter of Time (1951), "No superlatives are adequate; simply mark this down as one of the best, not of the year, but of all time." A Likely Story: The Sequel. Many mourned when A Likely Story, the 25-year-old children's bookstore in Alexandria, Virginia, shut its doors in November 2007. Now the Washington Post reports that former staffers of A Likely Story have opened a new children's bookstore in the same space: Hooray for Books. You can check out their blog here. Hooray for owners Trish Brown and Ellen Klein! Happy belated birthday, Rupert Croft-Cooke. 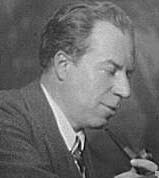 I missed on Friday the birthday of British poet-playwright-writer-critic Rupert Croft-Cooke (1903-79), the creator (under the name Leo Bruce) of placid and unerring detective Sergeant Beef and history teacher-sleuth Carolus Deene. Academy Chicago Publishers has reprinted some of the Beef and Deene works, including the classic The Case for Three Detectives (1936), in which Beef squares off against investigators clearly modeled on Sayers's Lord Peter Wimsey, Christie's Poirot, and Chesterton's Father Brown in a locked-room mystery. Here is an earlier discussion I posted on Croft-Cooke's work. Return of the Fat Man. Just when I'd lamented the out-of-print status of Rex Stout's oeuvre, along came the welcome news from Publishers Weekly that on June 25th Bantam is reissuing Fer-de-Lance and The League of Frightened Men in trade paperback ($15). I hope this is a portent of more to come. 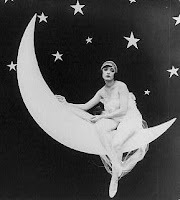 I'm guest blogging over at the Stiletto Gang today on the subject of mysteries as the Rodney Dangerfield of literature. The Library and Archives Canada is holding an exhibition through March 2009 on a national (and international) icon: Lucy Maud Montgomery's Anne of Green Gables. Because Anne-with-an-E turns 100 this year, Canada Post will issue special Anne stamps tomorrow, and Prince Edward Island, Anne Shirley's home, plans a year-long celebration. There will be a conference in October, "From Canada to the World: The Cultural Influence of Lucy Maud Montgomery," at the University of Guelph, a major depository for Montgomery's papers. Mike Kelly, curator of books at NYU's Fales Library and Special Collections, has posted a few covers from Fales's Levy Dime Novel Collection and one from Fales's collection of science fiction author Frank R. Stockton. The Millionaire Detective (1905) is a novelization of a play by Charles E. Blaney (1865-1944) and Howard Girard Hall (1878-1921). Great moments in literature, 1. "That Longfellow is said to have declined an invitation to the Adirondacks because he was told that Emerson was to carry a gun is really far more delightful, and I may add, valuable, information than to know the exact date of the birth of either." About the photo: The cautious Henry Wadsworth Longfellow. Library of Congress, Prints and Photographs Division. Bright Spot of the Day. Scholastic reported on a new survey in which 75 percent of kids between the ages of 5 and 17 agreed with the statement "No matter what I can do online, I'll always want to read books printed on paper," and 62 percent said they "prefer reading a book that is printed on paper over reading books on a handheld device or computer." About the photo: "Where Do I Begin?" by Angela Madonia, Jervis Public Library, Rome, NY. Honorable Mention in the Beyond Words: Celebrating America's Libraries Photo Contest. The Library Preservation blog has various photos and links regarding the University of Iowa attempting to save its special collections amid the rising flood waters. The American Library Association also reports. And here's news about the Cedar Rapids library. The University of Melbourne's Baillieu Library is holding the exhibition "Murderous Melbourne: A Celebration of Australian Crime Fiction and Place" through September 2008. Unfortunately, I could find little information about it. Those unable to attend may be able to content themselves with the library's online exhibition "Sensational Tales: Australian Popular Publishing 1850s-1990s." Great images here. Did they throw books instead of rice? Librarian Scott Douglas, author of Quiet, Please: Dispatches from a Public Librarian, gives us a glimpse into his recent book-themed wedding (where the tables all had an author theme--I suspect the Bob Dylan table was popular--and guests wrote notes to the bride and groom that they stuffed into date-due pockets). Happy birthday, E. W. Hornung. E. W. Hornung, Conan Doyle brother-in-law and creator of Raffles, the gentleman thief, was born today in 1866. He was dubbed by George Orwell "a very conscientious and on his level a very able writer" ("Raffles and Miss Blandish" 212). Clues: A Journal of Detection, the only U.S. academic journal on detective/mystery fiction (I am its managing editor), has moved to McFarland & Co. in Jefferson, North Carolina. Heldref Publications, the former owner, sold it as part of a general restructuring effort. Clues is a good match for McFarland, which has a strong popular culture line, including mystery reference works (I am editing a new series, the McFarland Companions to Mystery Fiction, for the publisher). In addition, McFarland's existing relationships with distributors such as Ingram and Baker & Taylor should facilitate the ordering of Clues for bookstores, libraries, and others. Online access to individual articles and entire issues via Metapress will continue (Clues is indexed in the MLA International Bibliography and by the Crime Fiction Canada Web site). The editorial team for Clues remains in place, with the additions of assistant editor Vassilena Parashkevova (London South Bank University, UK) and book review editor Jim Mancall (Harvard University); Clues reviews nonfiction mystery materials and those that would be useful in the classroom. Executive editor Margaret Kinsman (London South Bank University, UK) and I are busy with upcoming issues. The first issue from McFarland (vol. 26, no. 1) is part 2 of an issue on Victorian crime fiction, guest edited by Janice M. Allan (University of Salford, UK) and featuring articles on British-born but New Zealand-raised novelist Fergus Hume; British writers Mary Elizabeth Braddon, Edward Bulwer Lytton, Arthur Conan Doyle, and Catherine Louisa Pirkis; and American author Harriet Prescott Spofford. It will be followed by an issue on Scottish crime fiction, guest edited by Gill Plain (University of St. Andrews, UK). We have just issued a call for papers for a theme issue on Chester Himes and his legacy, guest edited by Norlisha Crawford (University of Wisconsin-Oshkosh). In addition: A gallery of Clues covers has been posted, and, thanks to the efforts of a small army of enthusiastic volunteers, article abstracts for the first 22 volumes of Clues are now online. The abstracts are highly educational: Where else could one learn that author-screenwriter Horace McCoy (They Shoot Horses, Don't They?) also wrote a gangster novel? Margaret, the Clues editorial board, and I hope the mystery community will continue to support Clues as a vital avenue of information and scholarship on mystery fiction. About the cover: Neve McIntosh as Lucy, Lady Audley, and Stephen Macintosh as Robert Audley in Mary Elizabeth Braddon's Lady Audley's Secret, broadcast on PBS's Mystery! in 2000. Image courtesy of WGBH, Boston. Happy birthday, Ken Follett; Craig Rice; Ivy Compton-Burnett. A trio of birthdays to celebrate: Ken Follett (Eye of the Needle author now writing on more religious themes) turns 59 today; Craig Rice (Home Sweet Homicide, etc. ), the only mystery writer to appear on the cover of Time magazine, marks a centenary today; and British novelist Ivy Compton-Burnett, whose work has been reissued by New York Review of Books Classics, was born today in 1884. From Yale's Beinecke Rare Book and Manuscript Library: A look at a November 1928 issue of Le Détective, a Paris investigative newspaper that claims that Chicago is "the capital of crime" and shows Chicago policemen nabbing a culprit. For their next book event, writers will also appreciate the photographs from The Popular Entertainer and Self-Instructor in Elocution (1898), which provides helpful poses of "hatred," "flight," "accusation," and "defiance." Mystery, winner: The Tin Roof Blowdown, by James Lee Burke, read by Will Patton. Thriller/suspense, winner: Heart-Shaped Box, by Joe Hill, read by Stephen Lang. Happy Centenary, Julie Campbell Tatham. Today marks the centenary of Julie Campbell Tatham, creator of girl sleuths Trixie Belden and Ginny Gordon, and writer of several of the Cherry Ames and Vicki Barr mysteries. She died in 1999. Trixie debuted in 1948 in Trixie Belden and the Secret of the Mansion, and Ginny in the same year in Ginny Gordon and the Mystery of the Disappearing Candlesticks.